Today is my hundredth Aloha Friday post. This is a cause for a celebration. An even better cause for celebration, though, is that on Sunday we’ll have NHL’s 8th birthday party. Also, on Wednesday, NHL will actually turn 8. Furthermore, later this month, B and I will do something we haven’t done in our 8 years of being parents: Have a vacation with just the two of us. 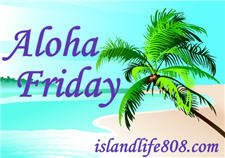 My 100th Aloha Friday question is: What types of celebrations have you had recently or will you be having soon? Last week we had hubby’s Class Reunion, and Sunday we’re celebrating my hubby’s Aunt’s 80th birthday & having a brunch party & the following Sunday is my cousin’s baby shower. We had a lot of birthday celebrations and will be having more birthday celebrations in the coming week.. oh yes and our trip to HK. Awww, congrats on NHL’s birthday! Speaking of birthdays, I’m due to give birth in a little bit here, so that is the one celebration we’ll be doing at my house! 🙂 Stopping by from Aloha Friday – Your blog design is outstanding! Love the clean lines! We celebrated our oldest son turning 18 and graduating high school in May. And, my husband and I had our 20th wedding anniversary in July. Our anniversary was on July 3rd, 2011. We celebrated by going out for lunch, now you have to realize we have been married 53 years, so the fireworks kind of celebrating as dwindled down to a few sparks. My hubby had a birthday last week and my mom’s is this Saturday. Lots of cake Lol!! Menopausal New Mom recently posted..Aloha Friday – Recurring Dream? We celebrated my daughter’s 3rd birthday a month ago, and next week we will celebrate her brother turning 6 months old! kailani recently posted..Join Our Back-to-School Blog Event!